A few more rows and I'll be finished with section 1. I think I'll be able to drop some stitches then but I haven't read ahead yet so I'm not sure. As you can see, I got nothing but knitting done again last night. But in my defense, I'm still sick and my back is killing me so housework and shopping are out of the question anyhow. I'm wishing now that I would have made a few more of those bunnies because they would have been cute decorations and gifts for Sunday. My problem is too many projects and not enough time. It is pouring rain here today. Totally miserable. But I see that part of the country is getting pounded with snow so I guess I shouldn't be complaining. I'll take the rain over snow any day. 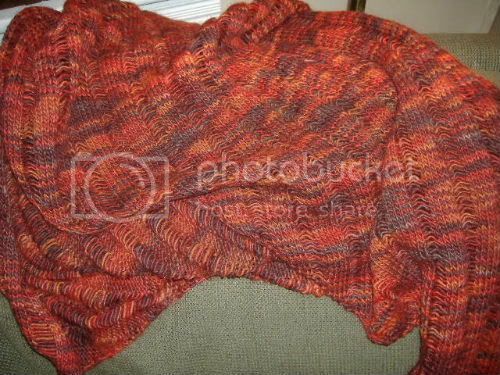 I absolutely love the color of your Clapotis! I am green with envy. har har.